Since my last post I've had lots of appointments for various things and not been as well. I've not been sleeping very well and suffering with migraines, so it's had an impact on the balance condition. It just makes it a little harder to focus, concentrate and feel less confident about getting out and about. It's all part of having Vestibulopathy with visual preference. It's a minor setback and I'll get back on track. I hope you remember my last post. If you don't -go back and read it and watch the video. You will see Consultant ENT surgeon Professor Rea talking about balance conditions and dizziness. He talked about the often dramatic affect it can have on people’s lives.. It's not all bad news I might add even though it can be a long process, help and treatment is available. In this video, Professor Rea explains what that help entails . Recovering from a balance condition requires a lot of hard work and effort on your part, making sure you do the exercises you are given. I want you to see the type of exercises you might have to do from a vestibular physiotherapist. So I'm going to be talking to the lady I see. In the next few posts I'll be bringing those to you. I’d really love for you to share your story with me – your journey! So I can share it with others. Professor Rea’s interview prompted a lot of you to get in touch privately. If you feel you can talk about it and would like to be a guest blogger, please do get in touch. Leave comments below, or seek me out on twitter @rupalr . Some of the people that have messaged me privately don't feel comfortable doing that and that's fine too.. I know for me , it seems to be helping. I don't feel so isolated, or as misunderstood . In fact I've noticed people/friends have become more considerate in how they behave with me. I don't have to try and explain what it is and how it's affecting me. They know, because they've been reading the blog. Which for ME, is a bonus. They know it's nothing sinister but know my limitations too and I don't feel as panicked about having to try and explain why I might not be able to do something. It's been really useful to write things down. There are always going to be people who just don't get it, or just can't be bothered to take the time to find out what you have and how it affects you. And you know what - I say- let them go! You really do find out who your friends are when your going through tough times. I certainly have. I've also discovered those that are true friends. I have an extremely supportive family and those close to me who are there when I need them. How many people have you known to have a dizzy spell, or suffer with a balance problem? Probably more than you think. There are so many causes and reasons why someone may experience dizziness and issues around their balance. As you know I have a condition known as Vestibulopathy with Visual Preference. I know others who have it too. Many people suffer with dizziness due to Migraines. There are other conditions such as Labyrinthitis , BBPV and many more . But just how big a problem is it here in the U.K.? 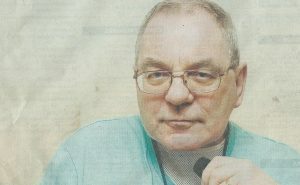 I've been lucky enough to speak to MY consultant -Professor Peter Rea, who is a Consultant, Ear,Nose and Throat surgeon in Leicester. He runs one of the biggest balance clinics in the U.K. where people travel from all over the world to see him. Surgically he works at the Leicester Royal Infirmary and privately at the London Rd Clinic in Leicester. I'm going to let him explain what some of the conditions mean and the impact it can have. And before I go , I must apologise for the lighting issues in the video. I'm learning about filming correctly as I go, hopefully the next video interview I do won't have as many issues. Please feel free to share and or leave comments below. Firstly I want to thank you if you got in touch following my first blog post. I was overwhelmed by the number of people who know me and many who don't , that got in touch. It's meant a lot. Most importantly though I want to thank you for getting in touch with your stories. Here's an extract of a message I received from a lady who wants to stay anonymous. Apologies for the random message but a friend recently sent me through your blog and I wanted to reach out privately as I felt that you've literally put every moment I'm going through into words. I was diagnosed with vestibular migraine around 3 years ago after 6 months of seeing GP's and suffer from the same symptoms as you. It's been a horrible life-changing experience that I haven't been well-equipped to deal with. I left a great job and have really bad agoraphobia now such that I do not/ cannot go out on my own. I've been on various medicines over the last year after having seen a specialist neuro and I've recently discovered they've actually been making me worse. These days I consider it a good day if I can stay out of bed all day because of the constant dizziness and weakness. That's quite a profound statement from a stranger who is going through something similar. I know, I'm not, and I know the lady concerned isn't after sympathy but just some understanding of what it's like living with such a condition. Further conversation with the lady proves she is positive that things will get better. it's the life changing impact it can have on a person I want to highlight. If you're reading this post and thinking it's all a big fuss about nothing or you're not sure what the condition is and how it affects people, I have some great news. I've been in touch with my consultant and he’s agreed to be interviewed for one of my posts. I hope in the near future to share that interview with you. Living with a balance condition can be hard, because you have to think about everything carefully before you do it. Each day can be so different. You can feel great one minute and feel lousy the next. If you have a cold or the flu it can make it worse, if you've not had enough sleep , it can make it worse. If you have other health conditions it can also make it worse. The biggest problem for me is the physiological affect it’s had. . You can become fearful- of going out, being in big crowds, crossing a main road, going shopping, most things in fact. When I am out , trying to walk in a straight line is rather difficult as I try to focus on doing just that . I'm told I look like a someone who’s had quite a bit to drink. So when it happened the second time round I thought I'd be better equipped to deal with it. Sadly not! I ended up having an ear infection, then the doctors thought it was labyrinthitis, so I was signed off from work for a few weeks, which then turned into months and now almost a year. I went to work for the first three or four weeks but I couldn't drive and couldn't get across the main road, so I was getting taxi’s to and from. I work for a radio station so I would just about manage a few hours on air and then go home. It got to a point I just couldn't do it and was signed off and here I am almost a year later, at home. The day to day challenges – just getting around without the fear of falling or banging into things. The attention you have to pay to things because your brain can't focus properly, the stares you give people because your trying to pay attention,. Watching tv , getting in and out of the shower. Standing up , sitting down . Trying to carry things and walk at the same time. Now that is difficult. And if it's more than one thing you're trying to carry that really is a challenge.Think of a toddler who’s learning to walk with a toy in its hands. How much concentration do you see on their face as they try to walk and carry an object at the same time. How often have you seen them fall and learn to get back up again. It's a little like that I guess. Having said that I'm a lot better than I was. I can do some of the things almost like before. Every time I am able to do something I couldn't, It’s a celebration. A little victory all of my own. I see a balance physio on a regular basis who is helping me with trying to re-train my brain. I'll tell you more about that in another post. For now though if you have questions, comments, feel free to ask in the comments section below. If you feel there's someone you know who might benefit from this blog , please share.